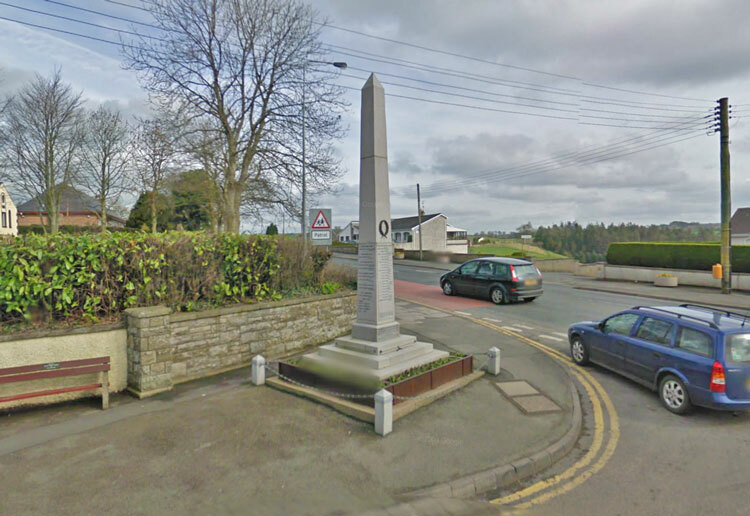 Clogher War Memorial is located at the junction of the Omagh and Aughnacloy roads, at the eastern end of the town. It was erected to perpetuate the memory of some thirty-six men from the town and district who paid the supreme sacrifice in the Great War. The memorial takes the form of a column of Irish granite standing 16ft. (5.1m) high on a base of three steps and tapered at the top. �In memory of the men of this district whose names are here inscribed who died in the great war, 1914-1918. Erected by their fellow-countrymen and women. From the Tyrone Courier and Dungannon News dated 21st September 1922. 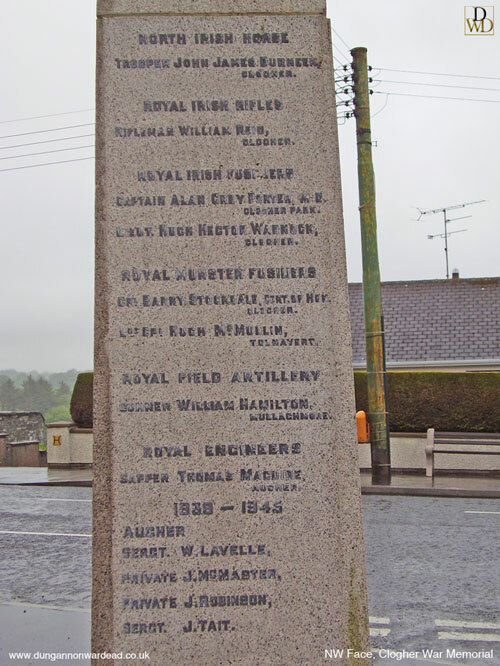 Clogher War Memorial. Address by General Ricardo. Horrors of War. The Memorial, erected by the people of Clogher and district to perpetuate the memory of the 36 men from the town and district who paid the supreme sacrifice in the late war, was unveiled on Thursday evening in the presence of a large company. The memorial takes the form of a beautiful column of Irish granite standing 16 feet high on a base of three steps and tapered at the top. It is situated in the eastern end of the town at the junction of the Omagh and Aughnacloy toads on a patch of ground attached to Clogher Schools, and granted by the Clogher Diocesan Board of Education. A large number of relatives were amongst the public attending the ceremony while about one hundred A and B Specials, in charge of Captain King and Captain Martelli, as well as a detachment of the Royal Inniskilling Fusiliers under Major Alexander, M.C., and Lieutenant McConnell from Omagh, were also present. Rev W H Bailey, M.A., Presbyterian Minister, Carntall, before calling on Brigadier General Ricardo, C.M.G., D.S.O., C.B.E., to unveil the memorial on behalf of the committee and at their request said that the memorial owed it initiative to a gentleman to whom the Great War brought the most poignant grief � the loss of a dear and gallant son. He referred to Mr Thomas Porter, J.P., till lately resident among them. As a native of the district he was moved with wide sympathy as well as with deep sorrow. He took pains to discover the wishes of all who were interested in the matter, as to how most fitting to perpetuate the memory of those in the district who had fallen in the great struggle for the world�s freedom. 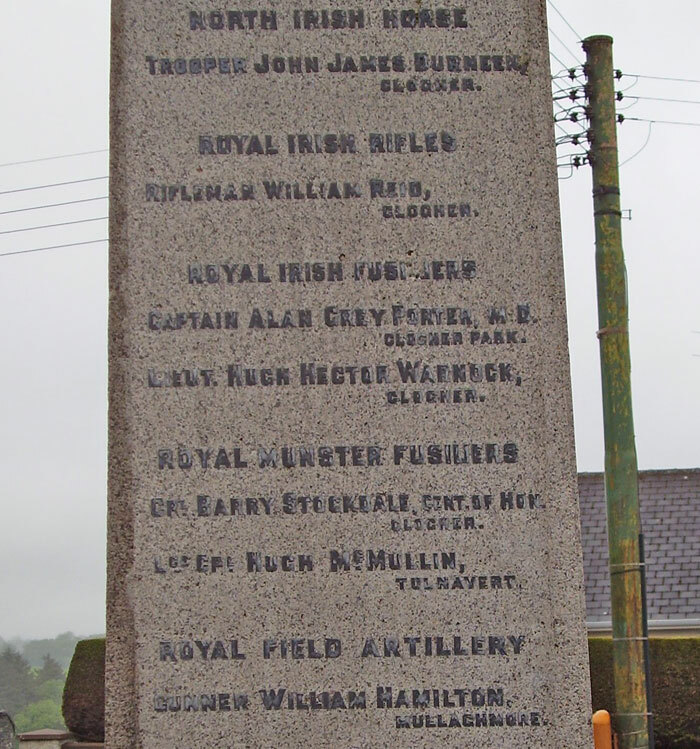 Accordingly, as stated in the original circular, it was decided that a memorial should be erected in Clogher in memory of all, irrespective of rank or creed, who at the same time resided in the neighbourhood and who gave their lives in the Great War. It was on that broad and brotherly and patriotic foundation that this column was erected, and in carrying out the project Mr Porter not only gave and obtained generous contributions, but gave time and thought and pains and effort to provide an appropriate and lasting memorial of those who fought for them, and whom they had dearly loved, and whose memory they wish to honour. They regretted that Mr Porter was not there for the completion of the work he inaugurated, and they were sorry and disappointed that Mrs Porter, who had consented to be present, was prevented by indisposition from attending. Brigadier General Ricardo then unveiled the column, and in doing so said their committee had conferred an honour and a great privilege on him in asking him to take part in that ceremony. He has soldiered with men from that valley and from that town, at various times, in different parts of the work, for the past thirty years, and they had seen some rough times together. It was on active service that one learned to know a man and to appreciate his qualities, and his experience of Clogher men had always been of the happiest. They had invariably proved themselves to be gallant soldiers and true comrades. Those whom they thought of that day were tested more sternly than any other soldier from Clogher ever was before and as one who was a comrade of them he could truly say to their relatives and friends that they might indeed be proud of them and that they did well to honour them by erecting that memorial. To those here from whose homes these men went out to do their duty never to return their hearts and sympathies went out today. Time is a blessed healer of sorrows, but days such as that were apt to reopen old woods, and the empty place was still unfilled. He had the honour of tasking part in very many of these ceremonies as that during the past two or three years, but that and one other, were different from the rest. Usually in that country a memorial was erected in a church in memory of a particular congregation. That was quite natural, but still he could not but regret that the example of Scotland and many parts of England, and invariably of towns in France, was not oftener followed in Ireland as it had been before, in erecting a memorial to all those from a town who have not come home. The men they honoured that day fought and died side by side in the Army of the Allies in the cause of right and justice in the trenches. They did not ask what a man�s creed or politics might be, sufficient that he was a brave man and a good comrade. In the cemeteries where they lie in France and elsewhere, there was no distinction between rich and poor, Orange or Green, and surely they were not divided on the other side of the veil. It was right therefore that that their names should be engraved side by side on the town memorial. In these days of strife and unrest in their country, a memorial such as that he thought, suggested thoughts of what an awful scourge war was. He had just read a very remarkable address by the Rector of Carrickfergus on the 9th July last on the subject, and he wished every man and women in Ulster could read it. His Reverence pointed out that the late war was the greatest and most horrible effort of force ever known in the world�s history. What had that force accomplished? Had it brought peace and contentment to either the victor or vanquished? Had it not nearly ruined all or most of the combatants? Have war or force proved to be any remedy for settling international differences? Surely all that it had settled was the certainty that war was nothing but wicked waste and utterly futile, and that it unsettled everything for years to come. If that were true of international differences, surely it was equally true of their differences in this country. Have the not seen for some time, preparations going on for a trial of strength in battle between the North and South? Was that going to settle anything? If the late war left nothing but sorrow and ruin in its trail, what would this island be like at the end of a civil or religious war? In the late war the combatants who survived returned to their homes and each country was left alone to lick its wounds and repair the damages as best it could, but in a civil war it was different. Even a civil war must end sometime and the combatants have then to settle down, if they can, and live together again where they have or had, their homes. Apart from the material ruin which it would take generations to repair, they must think of the ghastly legacy of hate left behind. Would life be then worth living? He did not think so. The consequences of civil war in Ireland would be appalling beyond anything they could conceive. No doubt force had been used to put down crime, but force of itself cannot bring peace and goodwill, and without those, Christian life must in the end become impossible. Don�t let them reserve those indispensable Christian virtues for the season of Christmas only. Let them be an everyday habit for all. There were so many things that divided them in this country, and he thought they made too much of them. In into camps, and as a consequence hatred and mistrust was rampant. Was there no alternative? He would say there was. In the army, man from these camps had always served together in brotherly comradeship and friendship, and had implicit trust in each other, and this memorial bore testimony to that fact. Had they all nothing in common that they could cling to and cherish? He would suggest one thing at any rate, and that was the love of their homes. Every man whose name was engraved on that memorial had a common love for that beautiful valley and an intense pride in the town of Clogher. Pride in his regiment had always been the very foundation of discipline and efficiency in every unit of the British Army. No good soldier would ever let his regiment down, and this pride was never stronger than in those old Irish regiments with their splendid history, the disbandment of many of which they deplore. He yet had hopes that some day they will be revived in some form or other. They can never perish altogether. Let them in Tyrone cherish this pride in the county where they lived. They could all join in this and if they pursued such avenues and forsake those that lead to strife and bitterness, surely they should attain that true peace which can only be based on trust and goodwill. He hoped that this memorial would be a constant reminder that Clogher men in the past had been trusted comrades to each other, proud of their native town and of their county, and what Clogher men have done in the past, Tyrone men and Tyrone women can do in the future. Let their county slogan be peace and goodwill for the honour of Tyrone. The Last Post was sounded by a military bugler, after which Major Stewart proposed a hearty vote of thanks to Brigadier General Ricardo, and presented him on behalf of ex-Q.M.S. Hamilton and local comrades of the Inniskillings with a little Union Jack, which was the first flag places on Messines Ridge following the big fight in that centre, as a memento of the occasion. Proceeding Major Stewart said they had paid a very high tribute of respect to their dead comrades, and also justified their choice in having such a distinguished person to unveil the memorial as Brigadier General Ricardo. They were also glad to have some officers and men of the Inniskillings with them, and they were proud to know that a few battalions of the Irish regiments are still left. (Hear, Hear). Mr Thomas McDowell, J.P., seconded and said coming there was only one of Brigadier General Ricardo�s kind acts. He was always ready and willing with his good services. 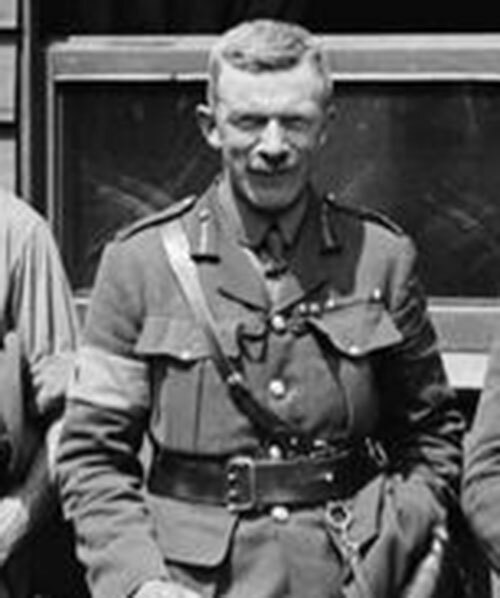 Rev W H Bailey, in conveying the vote of thanks, thanked Brigadier General Ricardo for his address which he hoped would not be lost sight of, and that it would help to bring about that peace among the nations which they all desired. During his long acquaintance with Clogher he never felt prouder of their men than he did on the present occasion or more touched with what their men had done and suffered than at the present time. Those touching memorials told of wounded hearts never to be healed in this world, and their true sympathy went out to those who had been struck by the grim arrows flung during the dark years of that war. They left that memorial to the people of Clogher as a precious heritage, and he trusted that it would always be regarded as such, and that they would have a right to protect and preserve it from violence or injury. It stood as a memorial of Christian charity, love and truth, and he hoped it would have the affect of drawing them all closer together then ever before and when those there here today had passed away, the names of these gallant men would not be forgotten. Brigadier General Ricardo suitably acknowledged and said he valued the memento very highly. The singing of the National Anthem terminated the proceedings. Relatives placed wreaths and floral tributes to the memory of loved ones on the base of the column following the ceremony.